Bidspirit auction | KIRCHER, CONRAD. 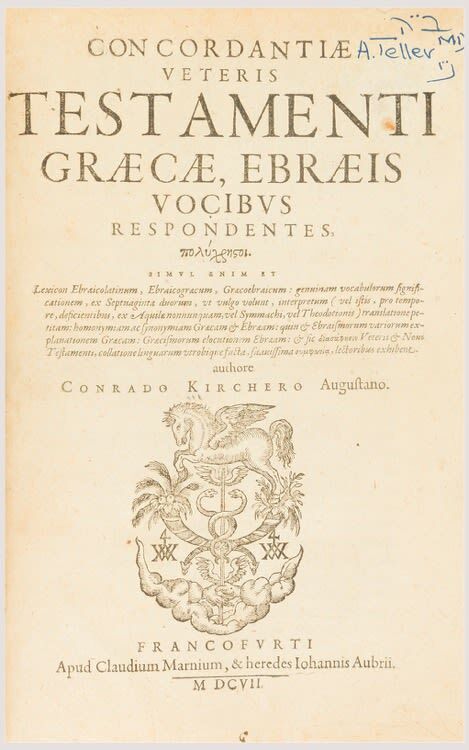 Concordantiae Veteris Testamenti Graecae, Ebraeis Vocibus Respondentes. First Edition. Two parts in one. Text in Greek, Latin and Hebrew. Printer’s mark on title. pp. , 2272 col.; 2310 col., , 290. Lightly foxed, edge of title neatly taped. Contemporary vellum, worn, taped repairs. Thick 4to. Frankfurt: Marnius & Aubrius, 1607.